On the InfoAssist application window, click the Application button to open the InfoAssist application main menu of procedure-related commands. When you click New, a splash screen that contains all available options opens, as shown in the following image. The available options are grouped into Getting Started and Help. Note: When you launch InfoAssist Basic, this splash screen indicates that the application is InfoAssist Basic and displays the available options. Build a Report. Opens the Open dialog box, where you can select a data source for your report. Build a Chart. Opens the Open dialog box, where you can select a data source for your chart. Build a Dashboard. Opens the Open dialog box, where you can select a data source for your dashboard. Build a Document. Opens the Open dialog box, where you can select a data source for your document. Open Existing Item. Opens the Open dialog box, where you can select an existing item. Change Default Options. Opens the Options window, where you can change the default settings to reflect your preferences. For more information, see Changing User Preferences. Close Application. Closes and exits the application. The Help options provide help for the new user. The following Help options are available when you open InfoAssist. InfoAssist Help. 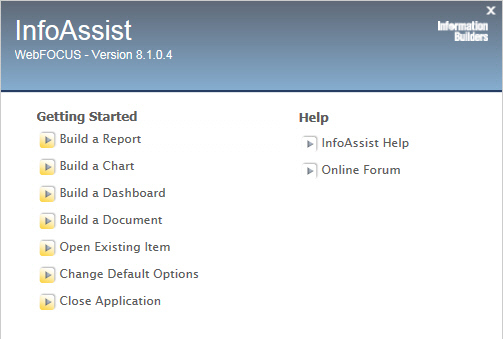 Opens the online documentation window for InfoAssist. Online Forum. Opens the Focal Point website in a new browser window.